Adam Driscoll takes the barriers in stride at Hyattsville CX. Birner wins the hole-shot and hit the barriers first. 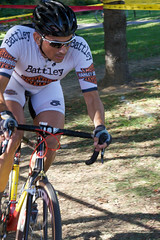 Mike Birner made his tough-to-please coach happy October 11 by winning the Men’s Masters Elite race at the first Hyattsville Cyclocross at Magruder Park, Maryland. A lot of times athletes will talk about hearing their coach’s voice while they are competing. I’m assuming this is the case for Birner, who as president of Mid-Maryland Coaching, is his own little voice. In this interview, Mike does a great job breaking down the race and giving some good insight on how to attack a course.